TERRYVILLE - Albert Molina is a fan of his glove. Actually, to tell it accurately, he has a full-blown infatuation. Well, the glove is certainly eye-grabbing when you look out to the mound and watch the lefty stalwart cross up batters and keep them off balance. It’s flashy, clean, slick and colorfully doused in a red and blue chroma with white webbing. Perhaps the most fascinating, unique aspect of the glove, however, is what is embroidered on the outside. The red, blue and white flag of Molina’s heritage, Puerto Rico, is finely stitched on the back, staring down opposing hitters as the southpaw works into his windup and fires away. Molina’s craze of the leather is notorious among his teammates. When asked about the glove, Molina looks down at it and begins to describe the story behind it, as one teammate yells at him, “Are you talking about your glove again? !” Apparently, another fellow Kangaroo attests, Molina talks about the glove “all the time,” so when someone else asks about it, he’s more than happy to show it off. As he geared up for the 2019 season, Molina realized he couldn’t find his old glove. He said he lost it in his basement, and he still has “no clue” where it is. The glove had vanished, and with preseason practices quickly approaching, Molina had to order a new one. Of course, as teammates once again rag on him for losing his original mitt, the junior rushes to his own defense and says that, “There was a hole where my [index finger was] in the webbing. … I got a new one not because I couldn’t find [my old one]. I got a new one because I had a hole in my other one. [My teammates] were not there. I promise it had a hole in it,” Molina says while flashing an ear-to-ear grin. So he ordered the splashy glove online, having it custom made by 44 Pro Gloves in California on the weekend of the Super Bowl. But the glove took more than a month to finally arrive, building up Molina’s stress. The first day pitchers and catchers were set to report, March 9, was inching closer, and Molina thought he might have to scrounge around in his basement in a last-ditch effort. Finally, the new glove mercifully arrived on March 8. It was love at first sight, and Molina has done an impeccable job ever since to keep it squeaky clean. After every single practice and game in which he uses it, he places it in a black and gold bag that has the words “Custom Made for Albert Molina” in gold cursive letters threaded on the front. When he gets home, Molina takes a sponge and wipes it down. Then he uses a special conditioner on it and rubs the inside before grabbing a rag to clean it off. Afterward, he lets it sit upright overnight to dry off, and he begins the entire process over again the next night. The process is laborious; some may see tedious. But Molina’s obsession with the glove is the perfect encapsulation of his devotion to the game, as he keeps the mitt as pristine as his box score Thursday night in a dominant gem against Thomaston. Molina’s four-pitch repertoire - four-seam fastball, changeup, slider and curve - was on full display. After walking the first two batters of the game, he settled in to twirl a complete-game two-hitter, allowing just one run on an RBI groundout in the first inning of a 3-1 victory. “He had me sweating early in the game because that’s not him. Typically, he’s a command and control kind of guy,” Terryville head coach Brian Rosano said. “He mixes and moves. He found a better feel for the off-speed stuff as he progressed throughout the game and then just started dotting his fastball to the outer half. We realized the umpire was gonna give us a lot on the outer corner, so we just continually pounded that spot, and we just kept going back to that well. Molina was an honorable mention All-Berkshire League selection last season, just missing the cut of the 13-member All-Berkshire Team that Roos catcher Colin Bamrick found himself on. 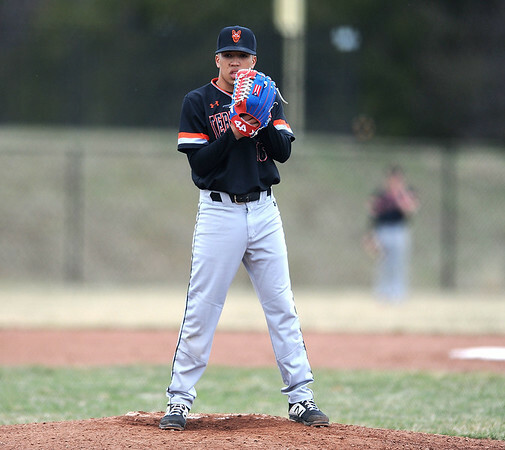 He finished 5-1 with a 3.21 ERA, proving he could handle the varsity innings. But there is a noticeable difference, both he and Bamrick say, about his mindset in 2019. He’s more confident and has better control of his secondary pitches. “He hits spot after spot after spot,” Bamrick said. “He had the fastball working [Thursday] and his slider, curveball and changeup, everything was on the plate for a strike. He was just keeping them off-balance. Molina is not a power pitcher. On a good day, Rosano says, Molina probably hits the low 80s on the radar gun. But with him, it’s not about the velocity. If Molina is sharp, he’s putting the ball where he wants, painting the corners with all four pitches. “He’s never gonna be someone to overpower people, but sometimes that’s harder to hit because you don’t know what’s coming,” Rosano said. “Sometimes my hardest job is figuring out which pitch to call because there are so many to choose from. It is a nice problem to have. Molina’s strategy on the mound is similar to what the Kangaroos (2-2) do on the field. They don’t overpower anyone collectively. That collectiveness was captured in a moment in the bottom of the second inning, as several players’ voices rose to encourage better approaches at the plate. The huddle was led by Molina, and that is perhaps the most noticeable difference between his mindset as a sophomore and his attitude as a junior. Posted in The Bristol Press, Terryville on Friday, 12 April 2019 21:18. Updated: Friday, 12 April 2019 21:21.